Reading phonics. Joined-up handwriting. Mastery of multiplication. All accepted as essential skills to have grasped by the age of six. But what about building your first app? As our society undergoes a rapid, digital transformation, computer science and coding are among the most important things we can teach kids today. Unfortunately, parents, teachers and governments still don’t fully grasp the importance of teaching computer science to Europe’s kids as soon as they arrive in primary school. Classrooms seem to be evolving at a glacial pace, leaving this essential 21st-century skill languishing in a 19th-century curriculum. In fact, according to a new European Schoolnet Report, coding is mentioned as a priority in only 15 European countries. It is for these reasons that the European Coding Initiative and the Secretariat of the Grand Coalition for Digital Jobs have teamed up to proactively support teachers across the continent through activities such as Massive Open Online Courses (MOOCs), online learning events, toolkits, and face-to-face workshops. We need to take action now to avoid leaving entire generations ill-equipped to find work and thrive in our modern workforce. To achieve this, we must focus on evolving three areas of Europe’s education systems: we need to continue to push for widespread curriculum reform; invest in teacher training to support this curriculum reform; and improve access to coding resources, courses and camps outside the classroom. According to a study by Pew Research, many share the concern that existing education systems are not adequately preparing us for life outside the school gates. To arm our young citizens with skills that match up to jobs available today, tomorrow and beyond, local governments need to completely rethink how we teach our kids about computing. Certainly, we can’t afford to put off discussing digital until students reach secondary school. We need to spark kids’ interest in computers as young as five and help them to build an app or game by six. Neurologist Harold Chugani, head of the PET Center at the Children's Hospital of Michigan, found that children’s brains learned fastest and easiest between the ages of four and 10. In fact, by the age of four, the cortex begins operating at adult activity levels which means it’s the perfect time to start introducing kids to a more digital way of thinking. Moreover, by piquing more girls’ interests in technology at an early age, we can encourage more young women to pursue tech in further learning and their careers, before gender bias creeps into the classroom. The new European Schoolnet Report shows that several European countries are making successful first steps, with more than 15 already integrating coding into the curriculum at national, regional or local level. For example, Finland is enforcing an education system that provides students with the skills required for a more technological, global society. The UK has also acknowledged the magnitude of the role that coding plays in strengthening the economy and was one of the first European countries to take the plunge and start teaching coding to five year olds. Yet to make digital skills mainstream across the continent, and not the exception, we need more local governments to shift their mind set. Education reform is a long-term goal. While the tides are turning, we need to think about our classroom leaders. The European Commission has acknowledged the need to help Europe’s six million teachers navigate the increasingly complex demands placed on them as our society changes. One area we need to focus on is teacher training. Our Educator Network provides resources to nearly one million teachers worldwide, and our IT Academy makes core technology skills more accessible to those who feel they lack the knowledge and confidence to teach students computer science. Understanding IT is the first step. But technology can also be used to change the way kids consume knowledge, helping them to further their digital skills without even trying. The idea of ‘flipping’ the classroom is gaining popularity overseas, with teachers assigning online tutorials and videos for students to watch at home, then working on homework with their class during school hours. Other tools, like Skype in the Classroom, offer pupils the chance to join teachers, guest speakers and field trips across the globe, bringing the real world to students’ desks. Even games such as Minecraft are now able to provide an immersive virtual world where teachers and students can create, connect and collaborate. Recognising that teachers are key to driving forward coding in the classroom, they are now given access to the right and most relevant training for the future workforce. This is a result of the cooperation between the European Coding Initiative and the Secretariat of the Grand Coalition for Digital Jobs. Already, more than 2000+ educators have registered for the two MOOCs on offer at both primary and secondary levels. More specifically, as part of this year’s Europe Code Week, the European Coding Initiative has created a toolkit for teachers on how they can get their classes involved in the week’s activities. By deepening their own digital knowledge, and adding new technological tools to their arsenal, Europe’s educators will be better placed to instil computational thinking in young minds – and spark an interest and a passion for all things digital in school goers. The final step to improving digital literacy comes from outside the classroom. Organisations of all shapes and sizes – not just tech firms – need to partner with the public sector to help young people across Europe advance their digital knowledge. This will require a step change in corporate thinking, too. According to Capgemini, a paltry 4% of companies are aligning training efforts with their digital strategy. To future-proof our economy we need to ramp up the digital learning opportunities available to everyone – from school kids, to recent graduates to young professionals – right now. Some organisations in Europe are already playing a vital role in addressing the digital skills gap. 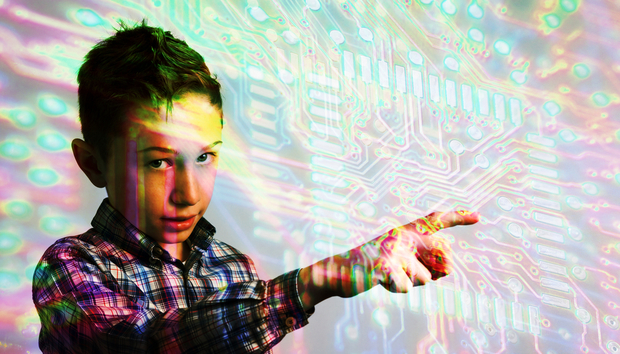 CoderDojo provides a fun, high-energy environment for over 30,000 young people to discover their digital potential. JuniorAchievement offers entrepreneurship and digital competence training, and helps to bridge the education-to-work gap. Telecentre Europe helps underprivileged Europeans by providing digital skills training and certifications. All these groups are striving to offer people skills and resources to explore their own potential in the digital landscape. And yet, this challenge won’t be completely overcome by coding camps. To affect real change, we need ongoing, sustained investment in computer science. This is why we’ve committed to channelling $75 million, over the next three years, into increasing access to computer science education for all youth, especially for those from under-represented backgrounds. Everyone, no matter where they live or what their background may be, deserves an opportunity to gain more digital exposure. It’s a big challenge, but one we need to rise to. By ingraining digital proficiency in our society we not only make Europeans more employable, but also foster widespread logical thinking and boost our collective problem solving skills. And with a life skill like that under our belts, just think of what we could achieve. « Will Windows 10 accelerate Smart Home adoption?